Last year an overture came to CRC Synod asking for a name change of "classis." How necessary do you think it is to change the name of classis? What time of impact might a name change have on the ministry of your classis? How comfortable are you with costs associated with a name change? If classis had a different name, would you better understand its function? Participants were also asked to share how long they’ve been part of the CRC and their role in the church. Finally, participants were asked, “If the CRC was a new denomination, what would YOU call classis?” All the responses to this question are shared in the graphic below (sized by frequency). Had you heard about this overture? What are your thoughts, and if given the chance, what name would you give to classis? I just don't get it. Why do we consistently insist on a rebranding? We change the names of our mission agencies -- okay, CRWRC was cumbersome. "Classis" has been our signature designation for the group of churches for more than a century. Every knowledgeable CRC person knows what a classis is. And yet, The Banner invariably insists on adding an identifier whenever it uses the term (ie Classis is a group of churches within a specific region). We seem to be under the mistaken notion that there are tens of thousands of new Christians flocking into our churches and picking up The Banner and then becoming absolutely stymied when they stumble across "classis". Can you imagine any sports league -- NFL, CFL, NHL, NBA -- changing their terminology so that fans can better understand the game? No. Fans learn the lingo. Similarly, we should refrain from treating pew-sitting CRC folk like children. They/we KNOW the language. We know what a classis is, or a synod, or an overture, or an NIV translation. Don't dumb down our church language. It won't attract one new convert. And that, after all -- proclaiming the gospel -- is what it really should be all about. I had not heard of this Overture. Interesting that an Overture is the first part of a Symphony. If I could start from the ground up I would call it a Cluster. While I agree with the gentleman above about the confusion created by renaming or ‘rebranding’ I also believe in ever reforming. More and more, people from diverse background are populating the CRC. I have found that even life-long CRC’ers are intimidated by such an ‘erudite’ word, which seems to suggest they do not belong. I have spent more time trying to explain the name (while unable to explain its choice) seeing as how Latin has been no one's primary language for centuries. The other interesting note is that Synod is a Greek word -is this a dual nod to the Vulgate and the original NT? I’m thinking out loud here. I would be for changing it but have no clue as to the cost repercussions and whether that would be worth it. While I respectfully agree that changing a name does not make new converts, I would like to add that for those churches who have a large number of their members who did NOT grow up in the CRC, a name like Classis DOES need to be explained. They did not grow up watching Classis on TV, like a football league etc. It can be challenging to explain how our denomination works, given that the majority of churches out there function very differently.Thank you! I have no opinion, but I don't see what is the urgency in changing that sort of name just for the sake of changing. There are more important issues to address than that, and it strikes me as a Major in Minors. If you're going to reform, why not reform the tendency to pass judgment on victims of abuse, as though they were to blame for what happened to them, for example. Yes absolutely, wow, you’re jumping in the deep end there Michele! Very true though. Are you involved with Safe Church? It’s a wonderful ministry when you start reading the materials they provide, addressing your concerns. No, I'm not involved in tha ministry although I do read stories once in awhile and If I run across something that's relevant elsewhere I'll bring it to the attention of the administrators. I'm a Regional Advocate for Disability Concerns, and I think that if you're sensitive to the needs of people with disabilities you can be sensitive to the needs of people who have been abused. It's not that big.of a stretch of the imagination, but I find that getting actively involved in Safe church would require more energy than I can spare. We too add "regional church body" to any printed mention of Classis in our communications. Whatever word or phrase we come up with needs to work as an adjective as well as a noun (e.g. Classical Appointment). Being part of a town clergy fellowship with 10 different denominations represented, it is interesting to hear how much we all use our own denomination lingo with the assumption that others know what we mean, even at a clergy level. In learning from fellow clergy about church polity structures we concluded that we all have complicated and historical structures whose names in themselves don't actually communicate their function in todays post-Christian society. In other words, it is insider language for sure. I'm good with "local church" "regional church" "bi-national church". Then add whatever thing or event you are talking about (meeting, leadership, decision, etc) At least that might actually say what we mean. I think this discussion is an extension of what many churches have already worked through locally. The word "Council" still communicates in our context as we have town councils here. Other churches have "board of elders" and such. People sort of get that it means, those leading etc. We don't use the word "consistory" any more either. We use, "the elders" "the deacons" "the council." I don't think any of this is a matter of dumbing down or treating people like children etc. I also think that our sports monikers communicate exactly what they are: NBA is National Basketball Association. It says what it is. It is National; it is the game of Basketball; and it is an Association. Same for Major League Baseball, National Hockey League. Classis and Synod say nothing of what it is except to those who memorize that detail. We have more important faith content for people to master than archaic lingo. In an information overload society, let's keep it clear. 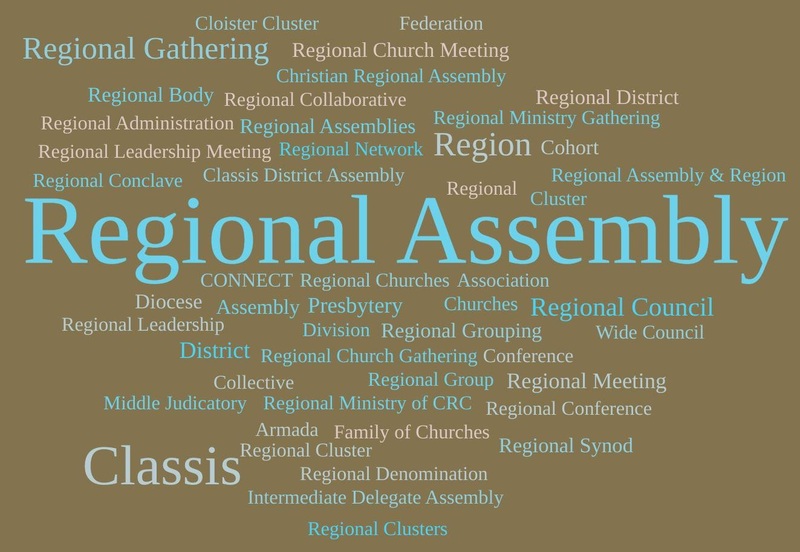 If one is determined to streamline our organizational language, then using General Assembly instead of Synod and Regional Assembly instead of Classis may make sense. So you'd have Regional Assembly Wisconsin (RAW), for example, or Regional Assembly Toronto (RAT). Or you'd preferably put the emphasis on the location, such as Grand Rapids North Regional Assembly or Holland Regional Assembly. a. Do the terms diocese or presbytery present the same problems as classis within their respective denominations, or is this simply a matter of church members losing touch with ecclesiastical language in a post modern secular society? b. Freighting in another term, even if it were diocese or presbytery, or some other term raises questions whether the new word adequately captures what the term classis encompasses in Christian Reformed church polity, i.e. governance. Each ecclesiastical body operates on different governance principles. From my perspective, growing up atheist, those words were part of the general vocabulary, I was at least familiar with them even if I didn’t exactly know who was part of a diocese. I had really never heard of Classis. I suspect it is because the CRC is considerably smaller than the other denominations. I’d never heard of the CRC either until I walked into a CRC church some 15 years ago. Obviously I liked it! Still here. New believers have to learn words like "propitiation", explaining our polity is just another part of discipleship. I didn't grow up CRC, the first time my pastor talked about "going to Classis" I thought he was talking about vocational training. Still, I see no reason to get rid of a perfectly useful traditional word. Too many are too eager to throw out the Reformed baby with the Dutch bathwater, pulling us either in a broad evangelical or mainline direction. Being a little unique here and there isn't necessarily a bad thing. I have not heard of this overture, but I am pleased that is has been submitted. I would suggest the the following be considered: "cluster"; "district"; and "huddle. This is part of a larger issue regarding words used historically in the CRC. Others include "contracta: and "consistory". As one who is relatively new to the CRC, all of the words tend to connote a sense of mystery and exclusion regarding the organization of the CRC. Such words are not very invitational to people who may be considering the CRC or one of its congregations. Such perceptual barriers need to be eliminated if the CRC is to slow the decades-long slide in membership. This is only one of the issues that pertain to this trend. As I continue to read this thread, and take part in discussions now and then, I am struck by the fact that we are making every effort to make our church language palatable for those who may be new to the church or to the faith. As we 'water down' our language, is there a subsequent desire to water down the Gospel? Will the time come when we find the terms 'sin' or 'hell' or 'damnation' offensive to the pew-sitter? I certainly hope not. And I hope that we continue to speak of justification, sanctification, propitiation and the notion that, unless we believe that Christ died for our sins, we're going to hell. It's one thing to be stuck on our structural language as long as we don't attempt to rewrite the creeds and doctrines to make it more palatable. I've made the ecumenical rounds, serving as director of communication for the CRCNA, The Presbyterian Church in Canada and The Anglican (Episcopal) Church of Canada. Talk about structural language, try figuring out what a primate, a diocese, a presbytery or the eucharist is. Water down salvation? Oh, no, God forbid, not from my perspective. I became a Christian at age 27 (38 years ago!) from generations of secular humanists and I am very clear that sin and hell are real. Hell might be a bit more remote (I believe it exists) but sin is present and crystal clear. Rest assured that the newcomers I know, never want to water down the beauty of the Gift of Salvation, the Gospel of good news. It saved us from ourselves here on earth, let alone the promise of eternity with Him in a place without sin and death, Heaven. Sure, Classis and Synod and Consistory and Council and Elder and Deacons -- and that's not even touching doctrine describing words -- are all strange words for some people who come to the CRC from outside of it. My church has quite a few "outsiders" in it, although none that I know of who care much one way or another about the need to assimilate a bit of a new vocabulary. I don't much care about the words used although changing the words (including CRC agencies) tends to make some who know a bit about the broader denomination feel a bit like, well, "it must have changed, why otherwise would they change all the labels?" I personally tend to keep up with "things denominational," but most people in my church don't, and frankly, I like it that most of the people in my church focus on local things. There's only so much time in a day and so many days in a week, and everyone is busy. I'd rather see them focus on local things. All of which would cause me to perhaps be on the side of leaving the names alone. Doing otherwise gives a sense to some (many?) who focus on local matters to seem even more separated from their denomination. Speaking of which, should we also change the word "denomination"? :-) And while we are doing it, "Christian REFORMED Church" (many from the outside first think we are something like a "reform school"). :-) Please don't take that as a suggestion -- I think that, all things considered, we do well to choose stability and maintaining a sense of history. Thank you. Everything you say makes a lot of sense actually... I do like these conversations for just such a reason: makes me see things from a different perspective. As someone who became a Christian in the CRC at the age of 17,and who later made profession of faith in this denomination I find that those who advocate we throw out terms like Classis because they're too difficult for outsiders to grasp are underestimating our intelligence. Like this debate about replacing Merry Christmas with Happy Holidays supposedly because it offends immigrants is hooey. Most of the time, it isn't immigrants who want this but unbelievers whose ancestors have been here for generations, and who grew up in the church but later gave up the faith. They're the ones who want to throw everything associated with Christianity out the window, not immigrants who'd rather we use our own holiday terms because they feel more free to use theirs then. Sometimes I have a feeling that some people in the CRC are embarrassed about the cultural origins of the denomination and project that onto outsiders. If you have a problem with your cultural origins, that is your problem not ours. 1. By the time you change bylaws, articles of incorporations, letterheads, website addresses, church order, and a whole host of other little things that will need to be done the financial and time considerations for individual church budgets, staff and volunteers will be significant. 2. Explanining Classis (and Synod) to someone who doesn't know takes literally 3 seconds. Jargon isn't a barrier and for many access to a new lexicon is a joyful opportunity to learn and explore - not to mention a boon for those of us who tackle crossword puzzles. 3. Watering down the terms removes the weight and significance of the event. A decision of the "regional gathering" lacks the impact of a "decision of Classis". While some may bristle at notions of structure and accountability, there is tremendous value in having those institutional distinctions. 4. There is no gospel necessity here and no real pragmatic value. Changing the name isn't going to jump start renewal of what is a semi-transitory, functional, meat and potatoes structure. This will neither change the function of Classis meetings nor the desire for people to want to serve. End it already. I'd say there are bigger fish to fry but this isn't even a fish. Hey, lots of response to a benign subject such as changing a name. Here is my thought. I have had the privilege of attending a few Classis meetings. What strikes me is that in every one, mission reps, youth ministry reps, safe church reps , chaplains etc. all report on how it is going,or what they have done, or the status of their area of expertise. To me that means accountability. Why not use a name such as “Regional Accountability Sessions”, or “Regional Accounting Meeting” (RAS, or RAM). Wouldn’t it help to explain what we do, and why we meet? Not only that, but it also shows that we as churches do hold each other accountable, we do not operate totally autonomous.